Described as one of the best kept secrets on the Irish festival scene, the Leixlip Festival is back for its 28th year this weekend. With the best of homegrown talent on show, Rock the Yard is a weekend not to be missed. Dublin rock band The Riptide Movement are no strangers to Rock the Yard. The four-man band first supported Bressie and The Blizzards at the gig a number of years ago. They’ll headline Sunday evening, June 3. Indie/folk band Brave Giant from Longford will support. 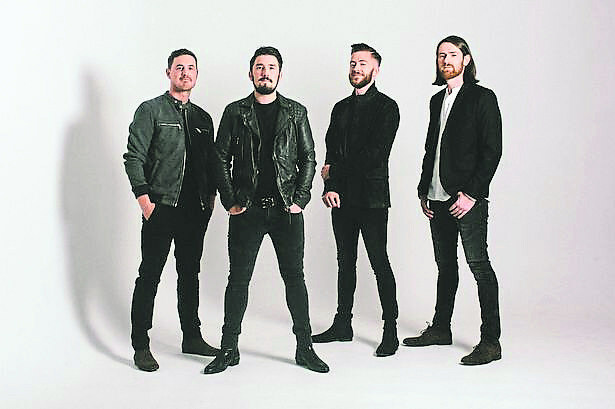 “It’s pretty much our local, we’ve been down in Leixlip when we were young going to the nightclub and the bars,” lead guitarist and writer JP Dalton told the Leader. JP said the festival is a great stepping stone for up-and-coming Irish singers and bands. “There’s not many places that would just stick with Irish talent. I remember when we were support to Bressie years and years ago, and it’s definitely a shot in the arm for a band kind of on the way up and they’re great for doing that, and you need people like that”, he added. The Leixlip Festival kicks off a busy summer for the band, who are doing a Coast to Coast tour of Ireland. They also release a new single, Plastic Ocean, on June 16. A band making their debut at the festival this year is two-piece folk group, Hudson Taylor. Formed in 2011, the band is made up of brothers Harry and Alfie Taylor. “Being apart of any Irish music festival, particularly big Irish lineups is super enjoyable. “There’s nothing quite like it, having travelled quite a bit around Europe and America, there’s something particularly nice about Irish bands, how they help each other out”, Harry told the Leader. The brothers headline Saturday June 2 of Rock the Yard. Hudson Taylor went on their first US tour, supporting Gabrielle Aplin earlier this year, and sold out shows across the UK and Europe. They enjoyed a successful homecoming tour, including playing to a sold-out crowd at Dublin’s famous Olympia Theatre. Some of the support acts confirmed include young Naas four-piece, The Rush, alternative rock band, Deaf Argument, and Dublin indie rockers Brass Phantoms, named by Hot Press as ‘Hot for 2018’ following their hit single Waiting Up. Columbia Mills’ guitar driven electronic sounds will Rock the Yard too, with a set including their critically acclaimed debut single Never Gonna Look At You The Same; while RSAG (Rarely Seen Above Ground) will see one-man-showman, Jeremy Hickey, wow the crowd with his unique percussion mixed hypnotic tunes and visuals. Wexford five-piece Corner Boy present their folk/roots rock sound on stage on Sunday, alongside local acoustic duo The Breakers, ahead of headliners, The Riptide Movement. Other headliners include Kormac’s Big Band, fronted by uber-talented musician and DJ, Cormac O’Halloran. Indie folk band, Brave Giant, from Longford, and the all-girl RnB trio, Wyvern Lingo, also feature in a jam-packed non-stop feast of musical sensation too, that includes Maniac 2000 DJ Mark McCabe on stage on Friday night, June 1. Monday night’s massively popular headliners, Smash Hits returns for 2018. Main stage music action starts on Friday June 1 from 7.00pm, with live acts on stage from 5.30pm on Saturday and Sunday, and Monday night’s closing gig kicking off at 9pm. Monday is family fun day at the Court Yard Hotel, with free children’s entertainment starting at 12.30pm that includes a Kids Disco, balloon sculpting, costumed entertainers, garden games and sweet treats. The Festival Food Court and the Court Yard Hotel dining room and bistro will be cooking upgourmet bites and great meals all weekend long too. Tickets for the highly anticipated music weekend are on sale on the Court Yard website www.courtyard.ie, with a weekend ticket costing €30. Individual day tickets are available in advance via the website too, at €10. They will be sold at the gate each day too, subject to availability.